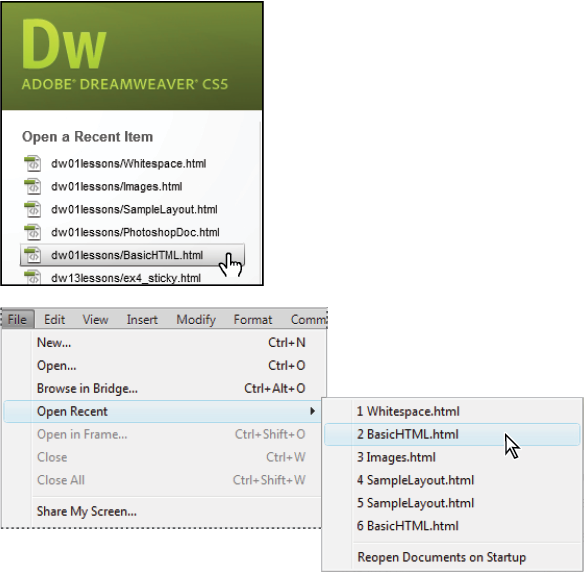 This tutorial provides you with a foundation for working with Adobe Dreamweaver documents. It is the first lesson in the Adobe Dreamweaver CS5 Digital Classroom book. For more Adobe Dreamweaver training options, visit AGI’s Dreamweaver Classes. The lessons throughout this book require that you create, save, and open existing files. You can accomplish most file-related tasks from the File menu at the top, or from the Welcome Screen that appears when you launch Dreamweaver. You can create blank files that you build from the ground up, or get started with a variety of layout templates and themes. You can create new documents from the File menu or from the Welcome Screen. 1 To create a new document, choose File > New. The New Document dialog box appears. 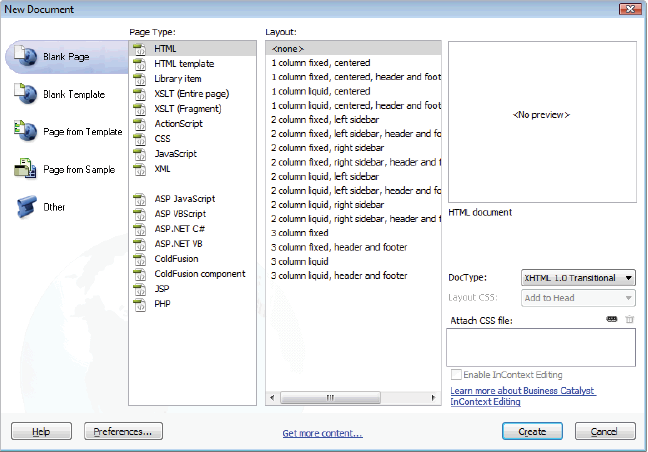 2 Select Blank Page and under the Page Type column, choose HTML. Under Layout, choose <none> to start a new blank document. Leave the DocType drop-down menu at its default. Press Create. 3 Choose File > Save or File > Save As to start the process of saving your document. 4 When prompted, choose a location for your file and assign it a name. Note that you must save HTML files with an .html extension, or they will not be interpreted properly in a browser. This rule applies for files of any type (such as .xml, .css, and .cfm). To open a document you’ve worked on recently, Choose File > Open Recent or, from the Welcome Screen, select a document under the Open a Recent Item column. select a recently opened file.